This flavour packed bread with characteristic slashes, is easy to make resulting in a delicious bread perfect for tearing and sharing. 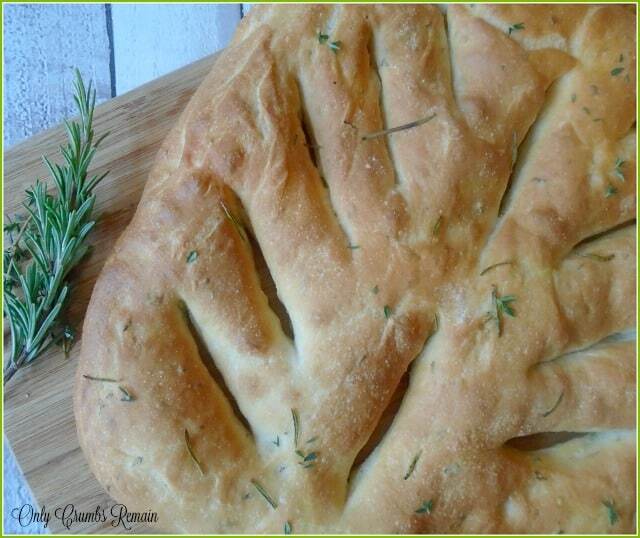 This recipe sees the dough flavoured with fresh herbs of rosemary and thyme. Bless Mr E, my husband, he sits alongside me every Wednesday evening watching the baking antics in the Great British Bake Off tent. Although he doesn’t watch it quite as intently as I do, he will still pass the occassional comment about something being a great bake and who he thinks deserves to be awarded star baker or even who he thinks is ready to go home. Following each and every episode I will ask him what bake he thinks I should tackle for my Great Bloggers Bake Along attempt. Invariably we both come to the same decision about what bake, or even bakes, the Only Crumbs Remain kitchen should whip up. This week was different though. The signature challenge of citrus meringue pie, which sang like an angel to me, didn’t appeal to Mr E due to his dislike of meringue. (I know! How can this be!) 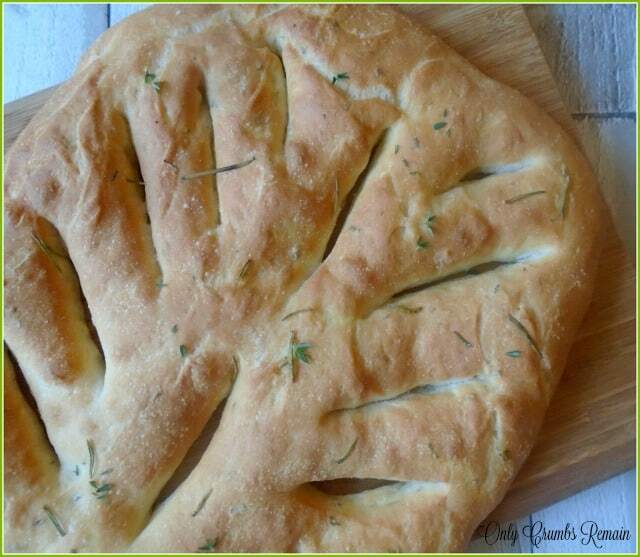 His taste buds lay with us trying Paul’s herby fougasse. So some baking multi-tasking was required this week to accomodate both of our likes. A herby fougasse dough with rosemary and thyme was set aside to proove whilst I whipped up the thyme pastry for our (or rather my) Lemon Meringue Pie. It’s been a number of months since I last made a ‘proper’ bread which required kneading. Due to a wrist problem, which limits the amount of pressure I can put through the joint without pain, we have been relying on no-knead bread and no-knead rosemary and garlic focaccia as well as shop bought loaves. Happily, because the fougasse dough is quite loose and soft it’s easy to work, and although that can mean the dough tends to be a little messy during the kneading process, the flour gradually absorbs more water making it less sticky and naturally ‘cleans’ your hands. Of course it’s even easier to make in a stand mixer with a dough hook attachment! recipe sees the dough flavoured with fresh herbs of rosemary and thyme. 1. Make the dough. Place the flour, salt and yeast into a good sized bowl. Avoid letting the yeast touch the salt at this stage. Combine with your hands. Make a well in the flour. Add the olive oil and three quarters of the water. With your hand mix the flour into the liquid aiming to make a dough. Gradually add the remaining water and mix with your hands until it is all incorporated. The dough will be quite soft. Drizzle a little olive oil onto your work surface. Place the dough onto the work surface. Knead the dough for about 8 minutes. Work in the herbs. Knead for a further two minutes until it is smooth, soft and very stretchy.2. Proove the dough. Oil a square plastic container with more olive oil. Place the dough into the container and afix the lid or cover with clingfilm. Set aside at room temperature for about an hour until it has doubled in size. 3. 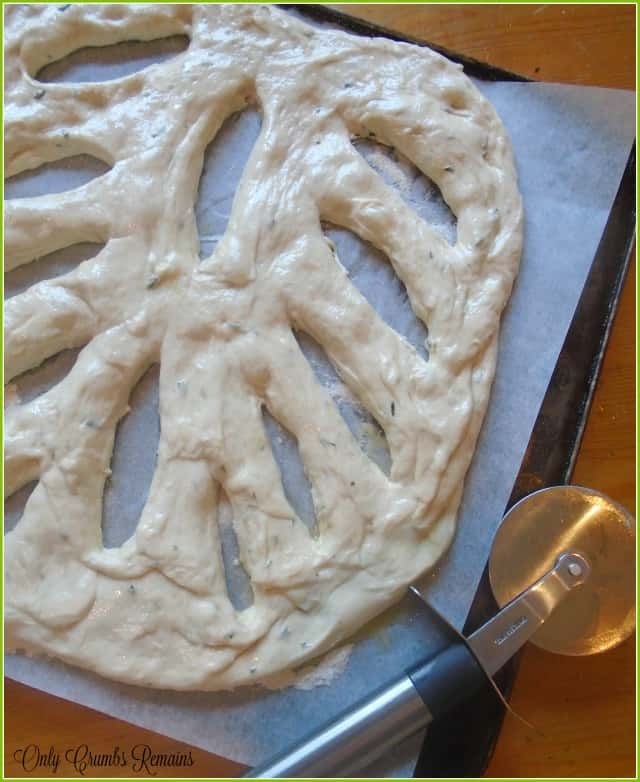 Prepare to shape the fougasse dough. Line a flat baking sheet with grease proof paper, tacking it down with margarine / butter at the corners. In a small bowl mix together a dessert spoon each of bread flour and fine semolina. Liberally scatter this over the greaseproof paper. 4. Shape the dough. Carefully tip the dough onto the prepared baking sheet. It will be quite a soft loose dough. Use your fingers to gently spread it out into an oval shape, allowing it to use most of the space on the baking sheet. Use a pizza wheel to cut the bread. Firstly make two vertical cuts through the centre of the dough. Avoid cutting to the very edge of the dough. Next make five or six cuts down both the left and right hand side of the dough. Again avoid cutting to the very edge of the dough. Use your fingers to open out the cuts. The dough will still feel a bit sticky, so you may find it helpful to coat your fingers in flour when opening up the cuts.5. Proove for a second time. Place the baking tray and dough into a large plastic bag. Trap air into the bag to inflate it, preventing the bag from touching the dough. Set aside for about 30 minutes. 6. Preheat the oven to 220c / 200 Fan / Gas 7.7. Bake. Carefully remove the baking tray and fougasse dough from the plastic bag. Drizzle olive oil over the dough. Scatter with a few fresh rosemary leaves. Place the baking tray into the hot oven and bake for 15 – 20 minutes. The bread will be nicely golden and will sound hollow when the base is tapped. The Bake off Bake Along co-hosted by Amanda at Rhyme and Ribbons and Ala at This Particular. I love that Mr E watches Bake Off too and gets a say in what you make after the show. Mr SearchingforSpice secretly likes it too and I've even caught him watching it by himself to catch up when I've watched it first! 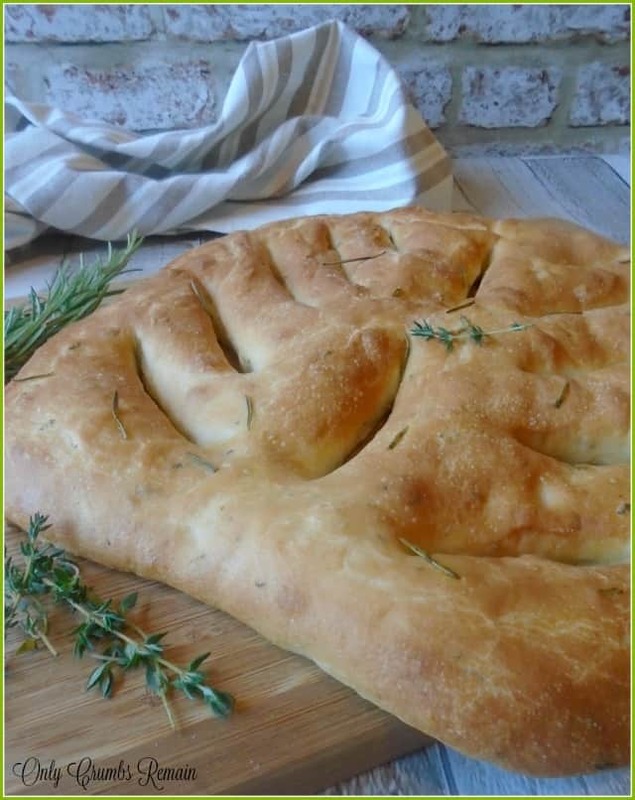 The fougasse looks delicious – I love homemade bread. Hahaha, I like that Mr SearchingforSpice catches up on the episodes that you have already seen, we've not had that eventually yet, but I don't think mr E would do that even though he helps in the decision about what to make! your bakes are just such a delight to see – it is so clear that so much love, care and passion has gone into them! It looks so good! I'm so impressed with all the bread being made, I need to give it a go! Hahaha, they're funny aren't they. Infact Mr E is often correct in his suggestions of who should get star baker and be sent home. I love baking along with GBBO Alison, I learn so many new techniques and get to try recipes I'd never heard of before let alone tried. Ah thankyou Anca. My hand mixer does have some dough hooks but I haven't actually considered using them thinking the dough would be too strong for the smaller engine of a hand mixer to work through. I'll have to give it a try seen as you've had success with it. Your finished loaf looks amazing Angela and I think you were right to reduce the amount made. I seldom knead dough by hand either opting like you for no knead breads or using a dough hook of my kenwood. Im going to have to make Fougasse at some point it look delicious. Yeah, I have to say that a lot of recipes are geared up for families and so when you are feeding only a couple of people the quantities really do need scaling back. We have a standmixer at home, sadly not a Kenwood, and although it came with dough hooks I've found it to be pretty useless at kneading bread dough to be honest. So it's usually no-knead bread, shop bought or I've even been known to enlist the help of hubby from time to time!